It is not often that college students are required by their teachers to write a feasibility study. However, when this happens, most students simply don’t know where to begin. In fact, many of them don’t even know what this project entitles. This is a very serious problem because if you don’t complete the school assignment on time, you will get a bad grade. And that low grade has every chance to ruin your GPA – the GPA you worked so much for! Don’t take any chances and read this blog post all the way to the end to find out what a feasibility study really is, how you can write one quickly, and who can help you with this kind of project. Because remember, this school assignment is one of the most difficult you can ever receive in college. So, What Is Feasibility Study in the First Place? Is the idea going to work? Should you go ahead with the idea? But make no mistake; the feasibility study is pretty difficult to write because it must go into great detail. You need to explain exactly why the idea will work or why it won’t work. You need to provide accurate information and credible stats and data. You need to support your arguments strongly. Imagine that you need to convince a board of investors that your idea is worthy of a few million dollars of their money. This is basically the feasibility study definition: a work that convinces others of the viability of an idea, with supporting, accurate data. Start by conducting a preliminary analysis of the idea. You need to make sure that the idea has at least some chance of being successful. Read a good feasibility study example to get an idea of how this paper looks like. You can find plenty of them online, of you can ask an academic writing company to compose one for you. Think about all the options that are related to your idea. How can you make the idea work best? Analyze the demand for your product. To be successful, your product needs to sell. And if nobody wants or needs it, the chances of selling the product are quite slim. Assess the competition and see if there is any chance your idea is better than their ideas. You need to stand out from the crowd. Think about all the challenges and come up with ways to overcome them. ALL the challenges, including technical and organizational challenges! As you are gathering all the data above, construct an outline. All the main ideas and talking points should have their own headings and subheadings. Add information to each section of the outline until you get the first draft ready. Don’t bother proofreading or editing anything, just add relevant information and statistics to support your idea. Edit and proofread the draft several times making sure everything flows well and there are no mistakes in the logic or in the writing. Write a great introduction and an even better conclusion. The readers should feel compelled to read all your paper and then take action at the end of it. Are you talking to investors? They are holding the money, so you need to convince them that your idea is the best and that it actually works! Need Some Assistance With Your Feasibility Study Project? As you can see, writing a feasibility study takes time and effort. It can take weeks to complete it. 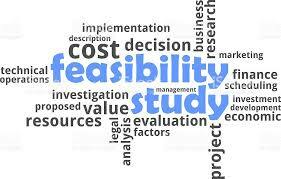 And now that you know what is feasibility study, you just need to know how you can get better at writing it. And the answer is simple: you just need a great feasibility study sample. If you have a great sample at your disposal, you can not only learn exactly how you can write your own paper, but also get some ideas from the existing study. There are several feasibility study types you can choose from, so we recommend you take advantage of an academic writing company. Its professional, certified writers can help you with a sample that is 100% original. You can use any part of their paper in your feasibility study project without having to worry that you are committing plagiarism. However, you will still have to put in the time and effort to write the best feasibility study possible. The reward is an A+!